VAF specializes in the Engineering & Manufacture of automatic self-cleaning individual, modular and skid-mounted filtration systems that include integrated controls and valves. 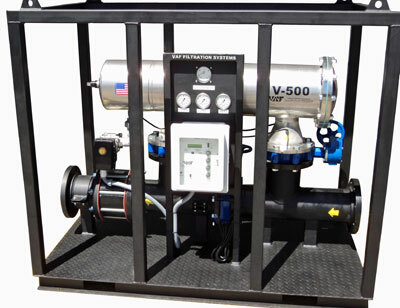 The V-Series™ automatic self-cleaning filter skid for “Frac” water (V-Series-FS) has been designed for easy portability; available in various configurations for local or remote oil field locations where the filtration skid needs to be relocated. Its unique design not only provides for quick piping hookups and disconnects, but includes a “roll bar” frame that protects the filter, control and piping from damage during relocation. The V-Series, 316L bodies, are horizontally designed for ease of maintenance and simpler operation with fewer moving parts. “VAF is successfully working with all the major oil companies to improve the Frac water quality before being reinjected”. “VAF is successfully working with all the major oil companies to improve the Frac water quality before being reinjected," said Steve Springer, VP. "This process is essential in helping to make the U.S. less reliant on foreign oil.” The V-FS filter skid is ideal for Frac water reinjection systems that require reduction or elimination of “consumable” cartridge or bag filtration. The 316L stainless steel, multi-layered filtering screen, utilizes a “Uni-weld, Sintered” technology that maximizes open screen area as well as the removal of organic and inorganic particulate from the screen. Inlet/outlet flange sizes can be specified to meet existing field piping. TRP Aftermarket Parts announces the availability of an AM/FM CD player with front-panel auxiliary input jack and matching coaxial speakers that offer operators a crystal-clear, hands-free way to answer calls on their cell phones. In the trucking business, where efficient cost-per-mile operating performance can lead straight to success, The Goodyear Tire & Rubber Company has come up with a new “gold standard.” The Gold Medallion Retread Tire Program is FleetHQ’s latest innovative service, offering cost-effective, quality retreaded tires for emergency road service from coast to coast. 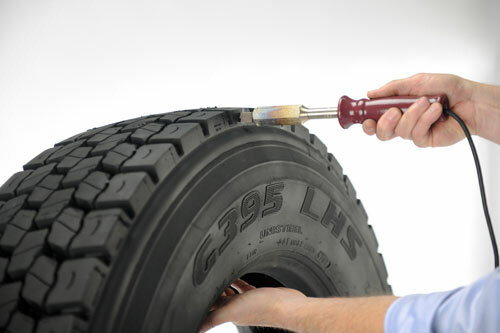 Gold Medallion retreads meet the premium casing standards of large national fleets and are backed by the Goodyear Retreaded Tire Limited Warranty. The BC Trucking Association (BCTA) has appointed Louise Yako as President & Chief Executive Officer effective June 1, 2011. BCTA is a province-wide non-profit motor carrier association formed solely to advance the interests of British Columbia motor carriers. Founded in 1913, BCTA represents for-hire and private carriers hauling every conceivable type of freight, including manufactured goods, heavy specialised commodities, bulk products, household goods and general freight. The Association also represents motor coach, courier, ready-mixed concrete and waste management companies and suppliers to the industry. Louise Yako has served BCTA for the past 15 years, first as Manager of Government and Inter-Agency Affairs, then as Director of Policy and Communications and most recently as Vice President of Policy, Communications and Partnerships. For customers, family and employees that participated in the BBQ fundraiser held by RWF BRON and Paul Pullins Enterprises, nothing stood out quite like the large, 550 BRON Drainage Plow sitting at the center of the festivities. The Canadian Trucking Alliance (CTA) used the Canadian Association of Chiefs of Police National Pipeline/Convoy Conference in Toronto held yesterday to unveil a groundbreaking study on cargo crime in Canada. CTA commissioned Lansdowne Technologies Inc., to conduct the study which involved months of collaboration between key stakeholders from trucking, law enforcement and the insurance sector. In addition to CTA, the study was sponsored by: Markel Insurance Company of Canada, Marsh Canada Limited, Zurich Insurance, TransCore Link Logistics, the British Columbia Trucking Association, the Saskatchewan Trucking Association, the Alberta Motor Transport Association, the Manitoba Trucking Association, the Ontario Trucking Association and the Atlantic Provinces Trucking Association. 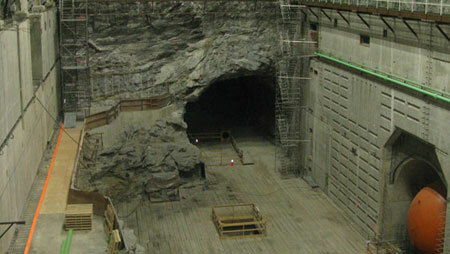 As part of its regeneration program to upgrade and renew B.C.’s electricity system, BC Hydro announced recently that Peter Kiewit Infrastructure Company has been awarded a $40 million contract for civil work needed to install the fifth and sixth generating units at Mica Generating Station. 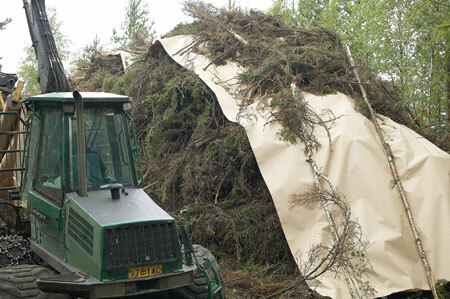 Logging residue is an inexpensive and easily accessible source of biofuel, but to improve the energy content it must first dry on the ground and after that it can be stored in piles for several months. To shelter the piles from moisture through rain, snow and ice, Walki has developed a paper-based, waterproof cover that can be chipped and burned together with the residue. The importance of biofuels is increasing globally due to tightening emissions restrictions. Interest in wood-based biofuels has also increased because there are new combustion technologies available on the market that are suitable for solid biofuels. The costs of tires are on the rise, jumping nearly seven per cent in the last month alone. John Correia of Coast Tire and Auto Service says the price of tires is going up, regardless of size, tread or make, and the increases are not going to stop any time soon. Where a hydraulic power system supply is available on site, then hydraulic cranes from J D Neuhaus can be a more practical option for all lifting and handling operations than their well established compressed air operated products.